When people think of doulas, they tend to picture them in the birth space doing all of the things—assisting in position changes, providing double hip-squeezes, coaching laboring clients through each contraction. During a cesarean birth, doulas are still offering the same nonjudgmental physical, emotional, and informational support that they always do, but the delivery often looks a little different. Just like any other method of birth, cesareans come with lots of decisions, questions, and concerns. Depending on the hospital, clients may still need to make choices about what the delivery will look like; for example, would they like a clear drape? Who will be present? Will there be music? Doulas still assist clients in considering their options and creating their ideal birth plans—and having a doula who is familiar with typical hospital policies can help clients really picture what their cesarean birth could look like before it happens. Partners may also have additional concerns when it comes to cesarean births—will they be allowed to be present during the delivery, or will they be waiting outside? In either scenario, doulas can help partners prepare for their roles in the process, supporting them as they anticipate what the birth may look like from their perspective. Because hospital policies vary, a doula may or may not be allowed to be present during the birth. Whether or not they are allowed, clients can count on their doulas to be there before the birth to help them prepare, and afterwards as they settle into recovery postpartum. When the doula is able to be present for the birth, clients still receive physical support—usually it’s a hand to hold (or squeeze!) during the delivery. And doulas still help clients and their partners process the series of events, keeping them calm or encouraging their excitement as their baby is born. When the doula is not allowed in the operating room, they remain on-call for their clients, ready to join them as soon as they are in recovery. If the partner is also not allowed to be present at the birth, the doula may remain with the partner, supporting them as the time passes and they wait to meet their baby for the first time. If the client wishes and we're permitted we'll capture pictures of the birth, immediately after and during the postpartum period. After baby is born, doulas stick around to help the new parents settle in. A doula may help clients initiate infant feeding, demonstrate some different swaddling techniques, answer questions about bonding with baby, and discuss plans for postpartum care for when everyone is back at home. If the baby needs to be taken to the NICU a doula can stay with the client allowing the other support person to be present with baby. A doula can help with what questions to ask in this situation. Doulas support the family as a whole not just the birthing mother. 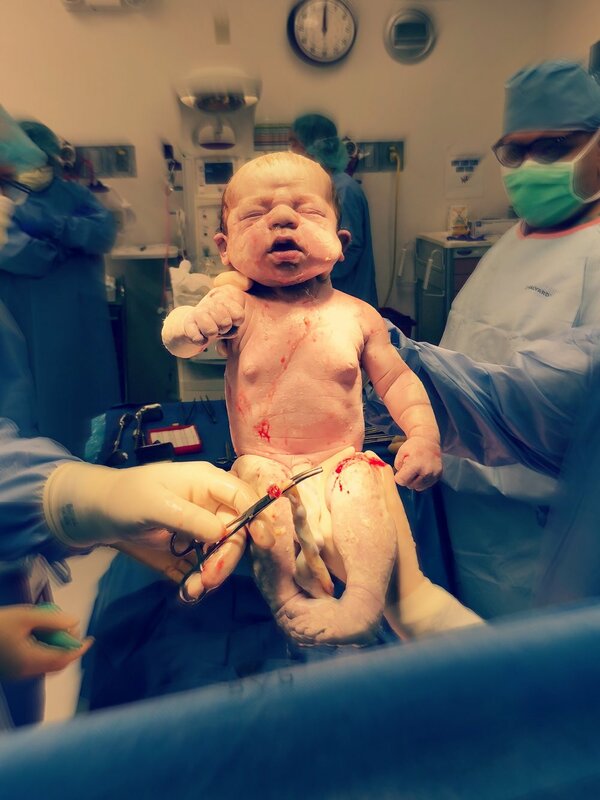 Ultimately, every birth is different, and cesarean births are no exception; while these are some examples of the support a doula may provide to clients who have cesareans, this is not an exhaustive list. Doulas are committed to providing support tailored to the individual needs of each and every client, no matter their method of birth—every time. A huge thank you to Larissa P. for allowing us to share her birth photos I captured this past Mother's Day weekend. I'll leave a selfie of myself too, smeared mascara and all!